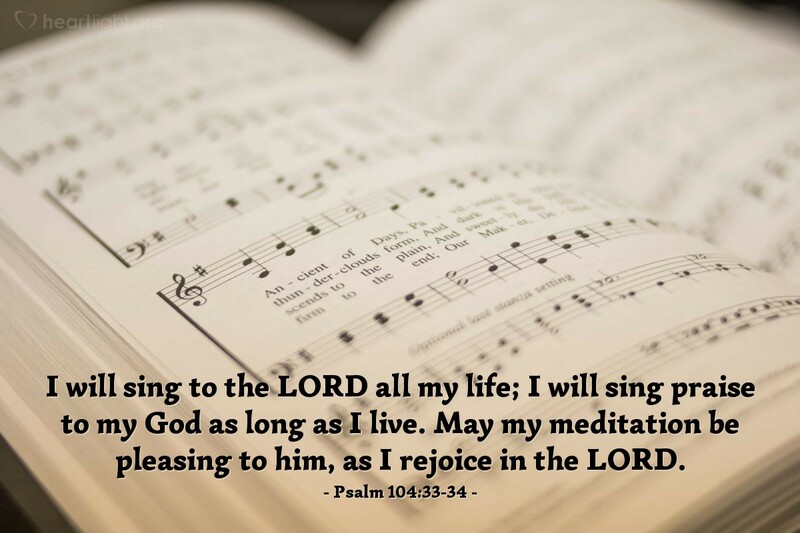 I will sing to the LORD all my life; I will sing praise to my God as long as I live. May my meditation be pleasing to him, as I rejoice in the LORD. Do you sing in the shower? What words are on your lips? Singing is such a wonderful gift! First, it is a gift from God to us, to help us express our joy, excitement, sorrow, and victory. Second, it is a gift from us to God, to help us communicate our respect, appreciation, love, and confidence in God. So let's sing, praising God for what he has done, proclaiming what he will do, and sharing what he is currently doing in our lives! O God, Father in heaven, even your name is holy. Please exert your will over my heart, and the hearts of those in our world, so it more closely reflects your holy character. I trust you, dear LORD, for the food I need each day. I ask you, Holy Father, to forgive me as I release my bitterness and anger which I have held against those who have wounded me. Empower me, O God, to resist the temptations and deceptions of the Evil One. Please make my life a glorious witness to your grace. In Jesus' name I pray. Amen.